Aging well for an artist is a double-edged sword, isn't it? On the one hand, we ourselves experience the fullness of time; our eyesight weakens, our hands don't always catch on to what our brains tell them to do and so on. With the other hand--and more relevant to this discussion--comes the bittersweet reality that what we create here on earth will also suffer at the hands of time. I call it bittersweet because many of the finer things in life become better with age--just like we hope our work will do. And, that is our expectation more often than not. We expect fancy restaurants to present us with a wine list befitting their three- and four-star ratings. We expect older homes to have a charm that newer constructions simply don't possess. Though in the US we don't see this as much, but elsewhere in the World, the elderly are looked on as vessels with something meaningful to impart from their well-lived years on this planet. And so it is with the works of artists. My students are often aghast at the prices fetched for masterworks. In an effort to pull them out of their consumable- and entertainment-driven stupor, I like to point out most ancient civilizations aren't remembered for their dignitaries or sports; rather it is the art and literature they created that stands the test of time. Suffice it to say, the paintings that artists create will undergo changes because of time. 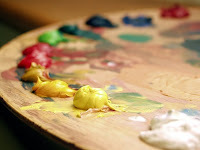 The important issue to be discussed presently is how will water soluble oil paints stand up to those imminent changes? On the whole, the evidence would indicate very well. In a previous post, I introduced the major players and their water soluble brands. Standing behind these players looms the American Society for Testing and Materials (ASTM), and their tests form the benchmark of light fastness, or how much exposure it take before colors begin to degrade. Their work is essential because it helps ensure the artwork that I have in my living room will look the same when it is handed down to my great-great-granddaughter in 75-100 years. The fact that a company may choose to conduct its own tests based on ASTM guidelines shouldn't necessarily raise red flags for an artist. Why? First, these companies have been around for a long time. This means they have spent time creating processes to make their business better. Secondly, you can do what I did and cross-reference the information on the manufacturer's primary product. If those products use the same rating system as their professional-quality oil colors then you know their water soluble line is equally important to them. And, thirdly, we're dealing with companies with reputations they need to uphold. They can't afford to mislead the public and thereby destroy the brand they've spent millions of dollars trying to build. So, there you have it. I hope that this gives you a springboard upon which to learn more on your own about these companies and their fine products. Any questions or comments, please let me know. Sorry I've been remiss in posting. My wife and I got sick concurrently with two different things. Then our 4-year old got sick. Ah, such is the life of a parent. As I indicated in my first post about water-soluble oils, I discovered a book by Sean Dye called Painting with Water-Soluble Oils that introduced me to a new product, transformed my understanding of oil paints and revealed a practical way for me to return to painting. Water soluble (water-mixable or water miscible) oils are similar in composition to traditional oil paints except that the oil medium in these paints has been altered on the molecular level to allow for water dilution and clean-up. So, the old axiom of water and oil not mixing isn’t true in this case. I’ve read a few online posts that the manufacturers use detergent to make the water solubility occur, but I was not able to confirm this through any legitimate source. Therefore, I would list such claims as questionable. Collateral I was able to find from the different manufacturers points to the chemically-altered makeup of the paints and not a simple additive formula (though additives do play a role). While not the definitive authority on the subject, Wikipedia concisely ascribes it to "the use of an oil medium in which one end of the molecule has been altered to bind loosely to water molecules...."
Similarly, Holbein speaks of their Duo Aqua brand as "an artist quality pigment in water-soluble linseed oil." LUKAS' Berlin brand is listed as "professional quality." large number of professional artists worldwide. Van Gogh H2Oil paints are not listed anywhere (either manufacturer or retail sites) as being professional. As Wikipedia conventiently points out, "The Royal Talens and Holbein paints do not use the traditional pigments that are based on cadmium and other heavy metals, which further reduces the toxicity risks of working with them." Well, that concludes the discussion for now. I encourage you to check out the manufacturer websites. There's a wealth of information out there on these paints. I've linked to the retailers selling some of the paints. I believe all of them offer starter sets if you'd like to experiment which I'd encourage you to do. Up next, I'll specifically address the feel of those paint brands I've worked with and what my results were when using them. If you've worked with water soluble oil paints, please let me know about your experience and what brand you used. I would love to hear from you! 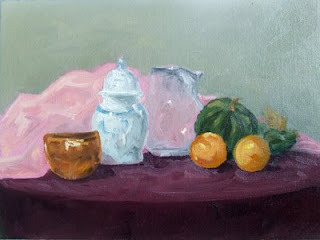 That Pink Thing was the last alla prima oil painting I did for my still life class I started in October. I have to say this was also one of the paintings I liked least from my class. While I liked the composition and a few of the components (e.g., the tablecloth and acorn squash, in particular), I made poor choices in the execution of this piece. I zoomed in some on the objects versus working smaller including more of the space surrounding the piece. While the colors harmonized overall, my application of the copper bowl wasn't as successful as I had done previously (e.g., It's Not Easy Being Blue and Fruit with Vessels. I'm probably reacting to the softness of the edge which makes the bowl feel more ceramic than metal. The white vessel next to the copper bowl proved the most disappointing because I screwed up the perspective of the blue stripe. I may go back and simply paint over the area to make the stripe nonexistent; you know, blend it in more. We'll see. Oh, and did I mention "that pink thing" in the back drove me nuts because I simply hated it. I'm sure most of my disdain stems from my not doing fabric well. 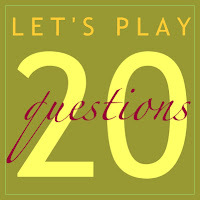 But, as I posted previously, I'm going to make that something to work on in 2009. It saddened me to realize that the new art classes will be starting at Fleisher in another couple of weeks. I had considered signing up again with Giovanni Casadei, but decided to hold off and do some work on my own at home. I am reviewing my goals for this year and I'll probably post something related to that as I've become more intentional about those musings as of late. On a final note, I will do a better job at photographing my work. Susan Martin Spar over at her art blog The Daily Muse recommended that I include close-ups of the surface to highlight my brushwork. I'll be more diligent with either doing such close-ups or making certain that when you click on the painting itself the enlargement sufficiently displays the surface texture. Thanks for your recommendation Susan! I've decided to take time on my blog to occasionally highlight a particular artist whose work I appreciate. It's my way of giving back to those who don't know me but have inspired me with their work and dedication to our craft. Joyce Washor has a new painting up on her art blog simply titled, Flower Composition. First, I love the painting. Second, it's actually a mini-tutorial detailing her style of working. Washor wrote a book called Big Art, Small Canvas which details how to compose and produce postcard-sized paintings. When you visit Joyce's website, you'll notice a few things. Joyce's paintings are 3"x4" in size. Though small, I think they are potent. She does an excellent job of bringing expression to her subjects with minimal strokes. Washor modulates form with a wonderful play of light and color. Her subjects include florals like Floral Arrangements, still lifes such as Still Life with Honey Jar and Sunflower and landscapes like Landscape Interiors with Steps. 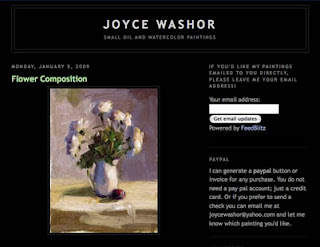 Please take a moment, visit Joyce Washor's art blog and look at what she has contributed and continues to bring to the artist community at large. She has another website that includes About, Resume, Workshops and a few other sections. Enjoy!